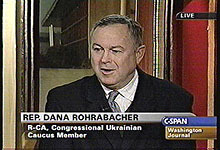 Congresswoman Marcy Kaptur (D-OH) along with Congressman Dana Rohrabacher (R-CA) appeared live on C-SPAN this morning at 8 a.m. on the Washington Journal program. 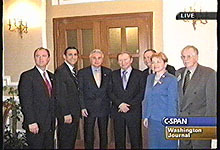 They spoke about their visit to Ukraine (Dec. 16-21) as part of a delegation of six members of Congress, and fielded call-in questions from viewers. Kaptur is also scheduled to appear on the Today Show on NBC on Sunday morning between 8:00 a.m. - 9:00 a.m.
For more information about Congresswoman Kaptur, visit her web site: www.house.gov/kaptur. 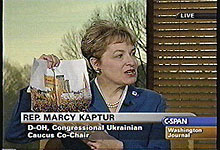 Congresswoman Kaptur is co-chair of the Congressional Ukrainian Caucus and has traveled extensively in Ukraine since 1973. She is of Ukrainian decent and her great-grandparents are buried there. Kaptur drafted the Rada-Congress Agreement and created the Anastasia Fund -- named after her mother -- a foundation for underprivileged Ukrainians. The delegation met with President Kuchma and VR Speaker Lytvyn. 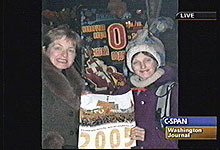 Marcy Kaptur in a photograph with a Yushchenko supporter, as described in the audio file.